I have a bit of a confession. Prior to being pregnant myself, I sort of thought that when people ate poorly when they were pregnant, it was because they were just using it as an excuse to indulge in whatever they want. (Don’t hate me, I was just naive haha!!!) Safe to say that I was incredibly humbled and the record has been set straight after the first trimester I experienced. Today I'm sharing the rough journal that I kept (in the Notes section of my phone no less) and then I'll share some advice on what I think can help when you feel like you’re dying from morning sickness! Weeks 4-6 of being pregnant (week 4 is basically when most people find out they’re pregnant) I craved really healthy food. I remember thinking to myself how this was going so well. Then, week 6 hit like a ton of bricks. Before I jump to that though, I actually started having food aversions before I even knew I was pregnant, without even realizing it. About a week before I took a pregnancy test, I said to Adam - wow, I haven’t had a matcha or any coffee this week. Then, one morning I made myself a coffee at home, went to take a sip and poured it out because it smelled so gross. I sometimes don’t love coffee anyways, so didn’t think much of it, but in retrospect, that was my first aversion. Back to week 6 when I started to notice that if I wasn’t full after a meal, I’d feel a bit weird. Not full on nauseous, but also weird. That lasted for a couple of days and then the full out morning (all-day) sickness started. Also, who named it MORNING sickness?!?! On a normal non-pregnant day, if I am feeling sick, the LAST thing I want to do is eat. So, for the first week or so that I was nauseous, I just ate less and less. Keep in mind, the smell of food was also revolting. I remember walking outside in our neighbourhood to get some blood work done and walking past an Indian restaurant and it taking ALL my concentration to get past that block and not throw up. I swear the smell lingered the entire block. Anyway, I quickly realized that eating less was definitely NOT the solution. The emptier your stomach, the worse you feel. One thing I noticed as the nausea started was that I really didn’t want to eat meat. For the 8 weeks I was sick, I ate primarily vegan. Not for any reason other than the fact that I couldn’t handle the thought of meat. FYI - This was from the Notes app of my phone, so is a bit scattered and may not have excellent grammar. Literally nothing appeals to me. I usually don't eat grains (they make me feel awful), but I've started eating plain Glutino crackers (gf) and my Mom's gluten free bread. Potatoes in any format. I did have full on french fries twice but they made me feel awful (shocking! ), so I stopped that. Also, cornflakes. I know. Can I even call myself a nutritionist anymore? Hehe! At least they were Nature’s Path gluten free cornflakes? Adam brings me a small bowl of cornflakes the second I wake up. Eating immediately upon waking really helps - like literally, I recommend having the food beside you if you can. Even thinking about food makes me feel sick. My naturopath recently asked me what I had been eating and I had to stop telling her because of how sick it made me just to recount it. *Update: I realized that eating grains did not make anything better. Even though it appealed to me the most, I was definitely more nauseous when eating things that wouldn't normally agree with me. And cheese. I asked Adam to buy some sheep’s cheese and he nearly fell off his chair. I had some and then threw up that night, so that was the end of my cheese cravings. As for smoothies, specifically the Buddhafull smoothie that has banana, peanut butter, hemp protein, almond milk, hemp and chia seeds. I ate one a day throughout the day for about 4 weeks straight. Couldn’t bear the thought of making it for myself and buying it out forced me to go for a small walk each day. One day I opted to get spinach in the smoothie to make myself feel better, but let’s just say that didn’t end well and I went back to veggie-less smoothies. People told me by week 10 it would start to get better. It hasn't. I feel like I’ve been on the teacups ride at the fair, for a month straight. My napping game is strong. Very grateful to be self employed and not have to be in an office job as I go through this. How do people do it?! Tofu from Tractor. (I literally ate SO much of this and I don’t even really like tofu normally. Since entering the second trimester, I have not eaten a bite of tofu, especially from Tractor because I’m now grossed out by it). Also, almonds. They are saving my life. I have a bowl of them everywhere and eat them in the night if I wake up and first thing in the morning. We had our second ultrasound this week - it was the most magical thing I’ve ever seen. The baby didn’t stop moving - we were joking how much of a dancer it is already (didn’t get that from us!). I think I texted the ultrasound photo to everyone in my phone I was so excited. I had a lunch & learn today where someone brought Chinese food. First of all, who brings Chinese food to a nutrition lunch & learn? Haha. Secondly, they closed the door to the room and I nearly died from the smell while giving the talk. Putting together my meal plans is NOT fun. I don’t even want to look at the recipes. I ate a vegetable (I can’t remember what it was, but I did write it down that I ate my first vegetable in likely 2 weeks). It feels like a small fog has lifted. Oh wait, just threw up again. Definitely still sick. The nausea is improving. I’m eating some real meals again (though definitely not cooking them). What I’m finding is as I feel better I am doing more, but I have to be really careful because if I get overtired, the nausea comes back in full force. I got ‘glutened' this week and felt nauseous for 3 days straight. I FEEL HUMAN AGAIN! HALLELUJAH!!! Prepare your body for pregnancy in advance, because I can *almost* guarantee you that you won't end up eating better than before once you're pregnant. Even though we ALL think we will. I can't say how many girlfriends I've chatted with who had this healthy 'vision' for themselves when they were pregnant. Then reality hits and you're just trying to survive. One of the reasons I didn't feel too guilty about what I was eating in the first trimester was because I knew how well I ate before, that I had been taking my prenatal nutrients for a long time leading up to this and that my nutrient values were probably pretty good. I credit this to my meal plans or my general way of eating that is super high in veggies, high quality meats (iron is important for pregnancy) and good quality fats (great for baby's brain!). 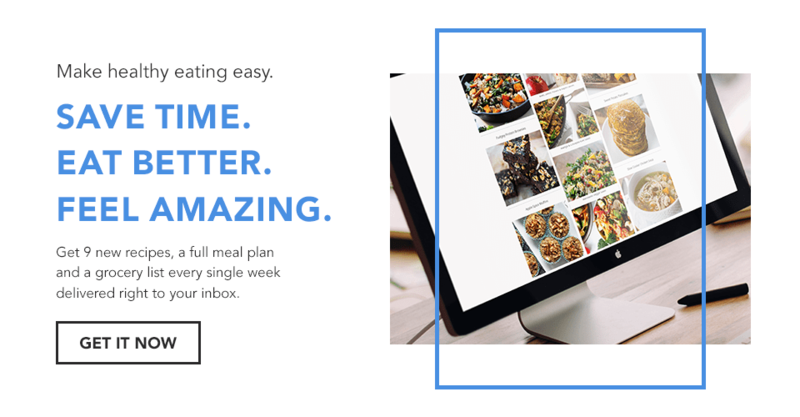 If you are thinking about getting pregnant, or simply want to up your nutrient game, I encourage you to join our Weekly Meal Planning Program. Do not let yourself get hungry. Even though food is the last thing you want, low blood sugar or an empty stomach makes it worse. Eat carbs. They will fill you up and satiate you. Just try to make them real food carbs. Sneak in some protein wherever you can, simply to manage your blood sugar. For me, this was protein powder in smoothies or my weird tofu phase. Eat almonds and have some with you at all times. Someone suggested this to me and I found their neutral plain taste to work really well. As much as you want it, avoid the foods you are sensitive to. Whenever I ate something that I typically wouldn’t (grains are a good example of this for me), it always left me feeling worse. Sometimes even into the next day. Ask for help! Have your family, friends, hubby, partner, whoever bring you food. You likely won’t want to cook. If you do have someone cooking at home and you have a BBQ, get them to make the food on the BBQ. It saves the smell from being in the house. Adam has become an expert BBQ’er. We literally roast vegetables, baked potatoes, make salmon/meat on there now. Thank GOODNESS this phase passed and I'm back to eating like normal (mostly!). I hope you found this useful! Have you experienced morning sickness? Let me know in the comments below.